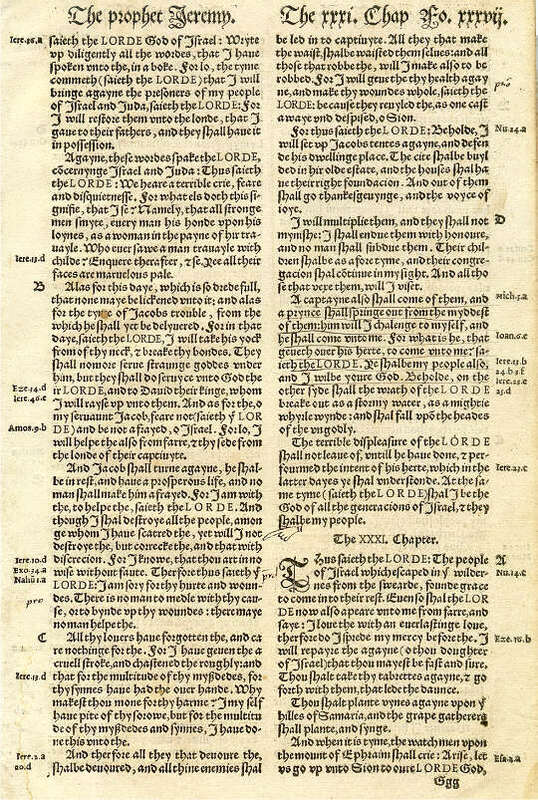 Although Coverdale included most of Tyndale's translation in his Bible, he chose not to use Tyndale's marginal notes, some of which were highly critical of the Catholic Church. That's why the margins only contain cross references to other Scripture. Although the text is divided into paragraphs, it would be 20 more years before verse divisions were created. Instead, each chapter was divided into 5 or 6 lettered sections. You can see these divisions in the margin along with the cross references — "B" and "C" in the left margin, with the chapter finishing up with Section "D" in the right margin. (The typeface makes them a little hard to read.) These chapter divisions were called "lecterns." Using this scheme, this page contains Jeremiah 30:a through Jeremiah 31:a. Use the Menu on the left to view a closeup of another page from a Coverdale Bible.